The book is the sequel to the national best seller ‘ The Immortals Of Meluha ‘ and the second book on ‘ The Shiva Trilogy ‘ series . The first book happened to stirr quite a discussion amongst the critic circle , for the author was seen embarking on an unprecendented venture in sketching Lord Shiva as a mortal being . It is advisable that you grab a copy of the first book of the series before you indulge in this one . The story is a seamless continuation of the first book and so also one might feel lost if one ignores the first one. 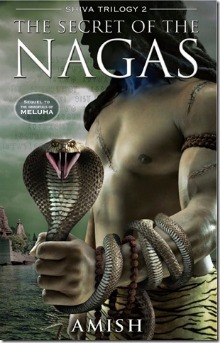 In the sequel , as the title hints , the true essence of the Nagas remains the cynosure . The Nagas are believed to be the purporters of evil , while the suryavanshas and the chandravanshas enjoy a shade of purity . Here we see , Shiva , Sati and their warriors inquisitely being on the look out for the Nagas , to destroy them eventually and thus bring peace . Another intention being the Lord Shiva’s quest in finding out the reason that led to the death of his brother Brahaspati. The destruction of the Nagas also seem necessary for the dampening of the plague and ill health that has been preying upon the Brangras . Eventually , the story thrusts forward effortlessly , enlightening the reader at regular intervals with nuggets , sewing together bits and pieces of the otherwise unreasoned facts that were seen embodied in mythology . The story has been delt in a way that sounds more plausible to the atheists out there, who outrightly shun the concept of God merely because of the unreasonability of the myths . But then , this is purely a fictionised version , which doesnt make the act of believing any more enticing for an atheist . While most of the incidents seem knit together in a way quite as Hindus believe to have occured centuries back , certain incidents are given intriguing twists and turns according to the whims and reasoning of the author . Needless to say , the book proved to be a compelling page turner for me , with the writing style being quite lucid , and sophisticated . It was a treat to find almost nil typos or grammer mistakes to serve as an aversion , which these days, has almost become an inevitable part of Indian publications ! . Being an ardent believer of Shiva , in a way , i was disappointed that Shiva is seen at his mellow best most of the times , having little in the story to highlight his prowess and greatness in its true sense , with Sati , Ganesha , Kali and the warriors seen more on the action front , even though the story revolves around magnanimity of Shiva . The character of Anandamayi has been given a naughty , sizzling edge to it , on her attempts to have Parvatheswar surrender to her love , in an almost filmy manner , lending a refreshing touch to the story at places . One thing that i missed was the absence of subtleties ,when the authors dwell into the fineries of the emotions and scenarios.The book was absolutely driven forward by the story leaving little space to drill minute details in between fast paced events and thus the intensity with which the characters are portrayed suffer a let down . Also , why would Shiva and his warriors smoke marijuana ?! Or did they in the epic stories too ? I am not so sure of that. Sadly,those portions brought the picture of the intoxicated kinds to my mind ! . However , its worth mentioning the philosophical titbits the author has sprinkled at places . For example , the concept of masculinity and femininity as inevitable parts of the character of each person , the depth of each , deciding the strength or fragility of our character . We have been sculptured with shades of good and bad and its we who need to weigh good over bad so that we are able to achieve ultimate sanctity . As for me , the portions which are going to linger for a while would be one , the revelation of the Naga identity and two , the aforesaid piece of thinking . I was reminded of The Davinvi Code and the other books in that series by Dan brown, when i found myself reading this book with the same utmost urgency . Definitely not a book thick on heavy words or intricate sentence construction ,which should make it an easy read . The sentences seemed to pour in , as if each word was meant to be , not a bit out of place or the plot skewed in any instance . You can finish the book in a matter of hours , maybe in a couple of sittings like i did . I am already looking forward to the last book on The Shiva Trilogy ! Next postYes , I Will ! Hey Malini! great review! I've read the first book and your review makes me get the second one. Thanks! hey thanks for dropping by 🙂 you should definitely be getting a copy of this one ! Gr8 reviews. It tempts me to read it at once.Also the flip side of the book says that its not over rated. thank u for such faithful reviewing. Keep up the good work. Also I wud request u to peep into mine and help me with suggestions.